Will the military allow reforms to continue? After nearly half a century of isolation, stagnation and iron-fisted rule by one of the developing world's last remaining military dictatorships, Myanmar (formerly Burma) has instituted a dramatic series of political and economic reforms. These changes, instituted during the past year by a civilian government run by a former general, indicate that the military may be willing to hand over power voluntarily — a scenario that few could have predicted as little as a year ago. Equally surprising, Aung San Suu Kyi, Myanmar's world-famous, pro-democracy dissident and opposition leader, was recently elected to Parliament and has greeted the reforms with “cautious optimism.” Western powers have responded to the nascent reforms by suspending economic and political sanctions and are beginning to invest in the desperately poor but resource-rich nation of 55 million people. 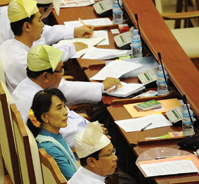 However, Myanmar faces a challenging future — especially in its treatment of ethnic minorities.